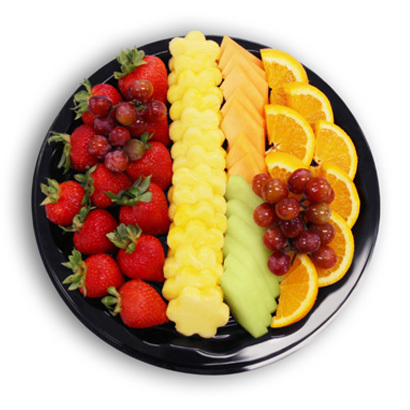 Made any office event, get-together, or party a little bit sweeter with our Slice of Sweet Fruit Platter! Made with only the freshest ingredients including freshly sliced pineapple, strawberries, melon, and more, this delightful catering tray is the perfect choice for any occasion – big or small. Plus, it’s even topped with our fun and festive pineapple daisy! 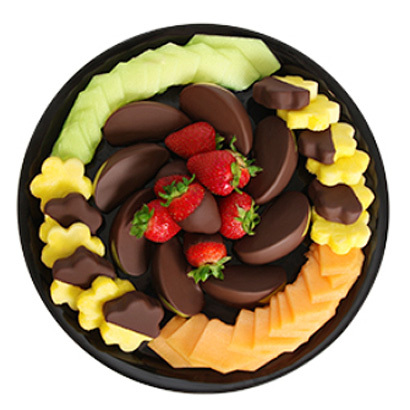 This shareable catering platter combines two of our favorite things: delicious, fresh fruit and decadent, semisweet chocolate. Featuring chocolate dipped strawberries, pineapple daisies, and Granny Smith apple wedges paired with an assortment of freshly sliced melon, this shareable treat has everything you need to impress clients, the attendees at your next office gathering, or even guests at parties! 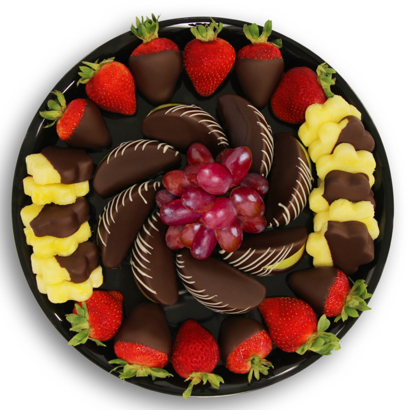 Treat your team at the office or the guests at your next get-together to this delicious fruit platter made to share! Featuring fresh orange slices, strawberries, our signature pineapple daisies, and so much more, this delicious tray of fresh fruit features something sweet for everyone’s taste buds. It’s perfect for parties, catered lunches, and more! Hand-crafted fruit platters and snack bundles. 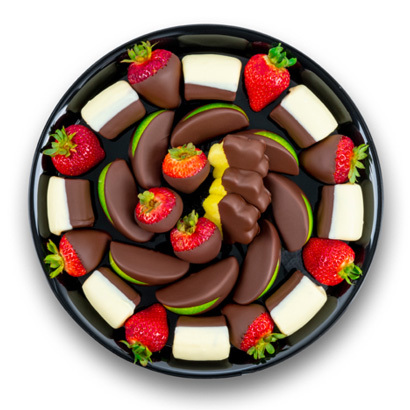 Treat your employees or party guests to shareable indulgence with this platter of decadent chocolate Dipped Fruit™! It’s filled with strawberries, pineapple daisies, and Granny Smith apple wedges hand-dipped in real, gourmet semisweet chocolate, and even fresh grapes! Plus, the chocolate dipped apple wedges are decorated with ribbons of white chocolate Swizzle® for added indulgence. 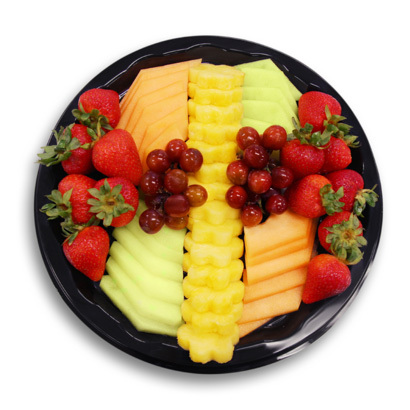 Thanks to this delicious, hand-crafted platter, serving freshly sliced fruit to all your guests has never been easier! Whether you’re hosting a lunch meeting at the office or a Sunday brunch for the family, this platter of strawberries, grapes, assorted melon, and our signature pineapple daisies is the perfect choice. From kids’ birthday parties to office occasions with the whole team, our Strawberry Dipped Fruit™ Cone Snack Pack is sure to be a crowd-pleaser! 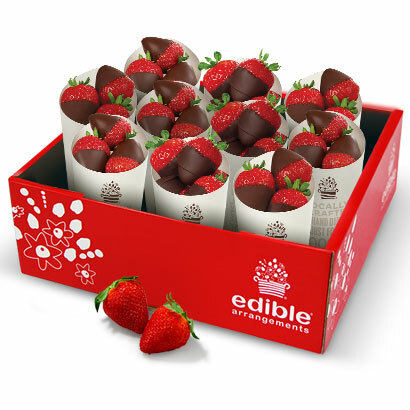 Each Dipped Fruit™ Cone is filled with the freshest strawberries, carefully hand-dipped in gourmet semisweet chocolate and packaged in an easy-to-carry box. *Each Strawberry Dipped Fruit™ Cone Snack Pack comes with 10 cones. Celebrate your team at the office or parties at school with our Banana Dipped Fruit™ Cone Snack Pack! 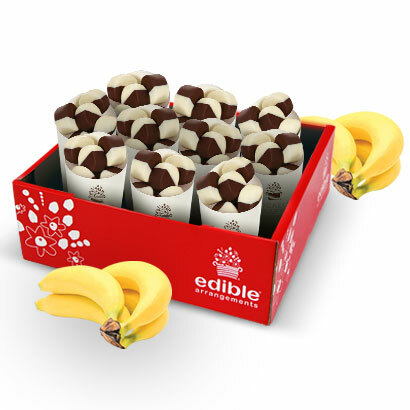 Each Dipped Fruit™ Cone is filled with fresh banana bites dipped in white and semisweet chocolate and packaged in a box for easy transport. It’s the perfect snack-sized treat for all sorts of occasions! *Each Banana Dipped Fruit™ Cone Snack Pack comes with 10 cones. From employee appreciation treats to birthday party snacks, our Apple Dipped Fruit™ Cone Snack Pack is the perfect solution! Inside this easy-to-carry box, you’ll find Dipped Fruit™ Cones filled with gourmet semisweet chocolate dipped Granny Smith apple bites. It’s a unique party dessert or snack they won’t be able to resist! 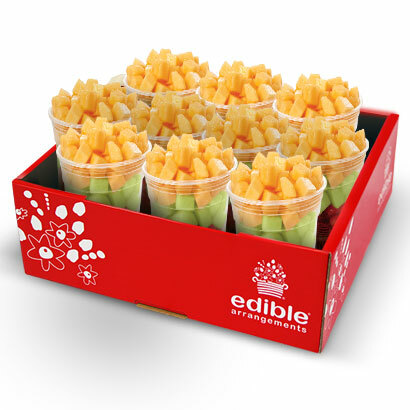 *Each Apple Dipped Fruit™ Cone Snack Pack comes with 10 cones. Thanks to our Fresh Fruit Salad Snack Pack, treating your team or friends and family to a refreshing surprise has never been easier! This grab-and-go box is filled with delicious fruit salads made from a variety of freshly cut fruit. *Each Fresh Fruit Salad Snack Pack comes with 10 cones. 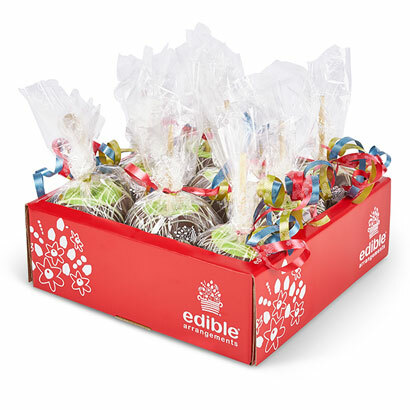 Thank your team or celebrate your clients with this gourmet grab-and-go pack of delicious chocolate and caramel covered apples! Each fresh, whole Granny Smith apple is hand-dipped in smooth, buttery caramel, then topped with an outer layer of real, gourmet semisweet chocolate. Plus, they’re decorated with ribbons of white chocolate Swizzle® for added indulgence and individually wrapped for grab-and-go convenience. *Comes with eight fresh chocolate caramel covered apples. Celebrate your employees, thank your clients, or treat your VIP customers to this delicious, gourmet chocolate Dipped Fruit™ box bundle! 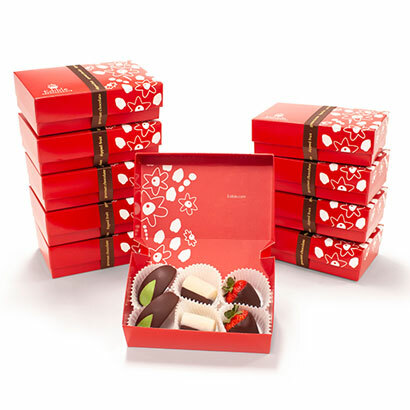 Each 6-count box in this 10-box gift bundle features a delectable sampling of semisweet chocolate dipped strawberries, semisweet chocolate dipped Granny Smith apple wedges, and white and semisweet chocolate dipped banana bites. It’s the perfect party favor or business gift! Fresh news: You can now order select fresh fruit treats online and pick up in your local Edible® store! Choose from a selection of our fresh fruit salads, chocolate Dipped Fruit™ Cones, smoothies and froyo. * Go ahead, treat yourself. If you ask us, the only thing better than our iconic chocolate dipped strawberries is getting to enjoy them on the go! 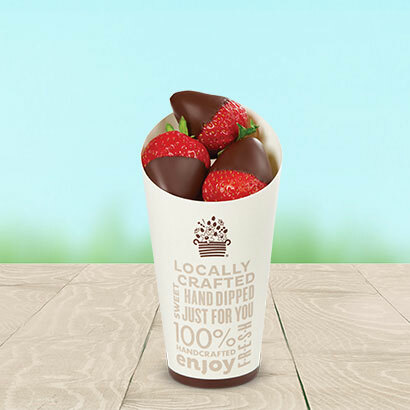 Our Chocolate Dipped Strawberries Cone is made with fresh, juicy strawberries hand-dipped in real, gourmet chocolate, then perfectly packaged in a cup holder-friendly cup. 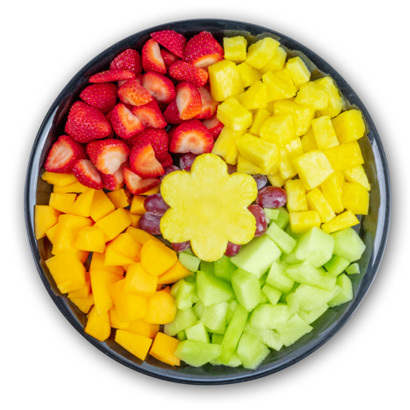 Once you place your order online, one of our Fruit Experts® from the store near you will make it fresh for you to enjoy right when you arrive! Earn your rightful place as game-day party MVP with our Edible® Donuts – Sports Mix! Get the crowd on their feet with an irresistibly sweet starting lineup of fresh slices of donut-shaped Granny Smith apple hand-dipped in real, gourmet semisweet chocolate. 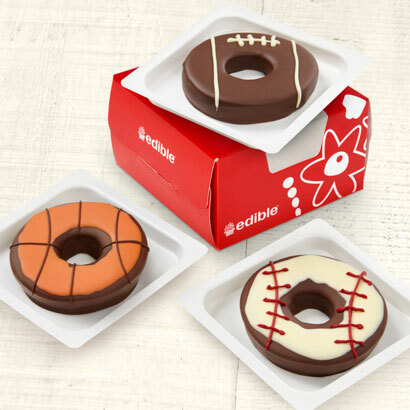 Carefully hand-decorated to look like a baseball, basketball, and football, these Edible® Donuts are sure to be a standout among the dessert spread. Our 16oz. Fresh Fruit Salad is proof that you can never go wrong with a classic. 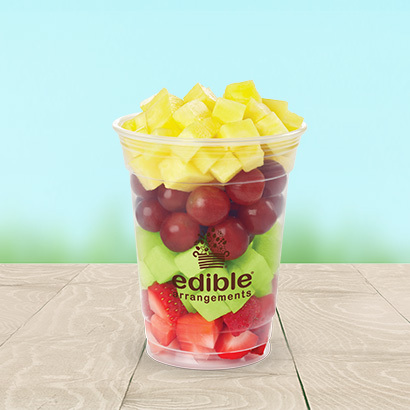 Carefully crafted with layers of fresh strawberries, grapes, pineapple, honeydew, or cantaloupe, this delightful grab-and-go treat delivers refreshment with every bite! Simply place your order online, then stop by the store near you so that one of our Fruit Experts® can make it fresh in just minutes for you to enjoy right when you arrive! Double the indulgence with our 16oz. Fresh Fruit Salad and Chocolate Dipped Strawberries Cone! 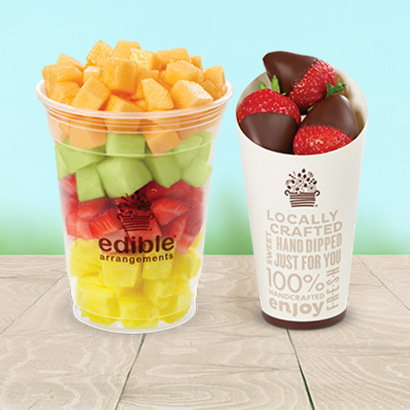 With this treat, you get the best of both worlds – refreshing and delicious mixed fresh fruit paired with our signature strawberries dipped in real, gourmet chocolate. Simply place your order online, then stop by the store near you so that one of our Fruit Experts® can make it fresh in just minutes for you to enjoy right when you arrive! 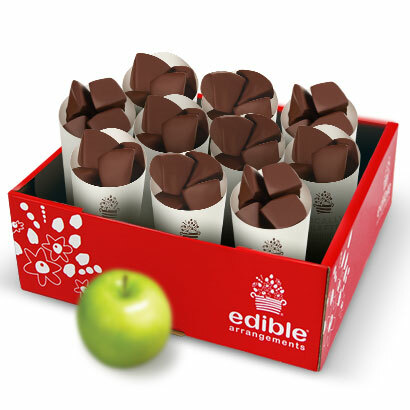 Crisp, fresh Granny Smith apple bites hand-dipped in real, gourmet chocolate make our Chocolate Dipped Apple Bites Cone is a perfectly sweet pick-me-up! Packaged in a cup holder-friendly cup, this grab-and-go treat is the ultimate way to enjoy a moment of indulgence on the go. Once you place your order online, one of our Fruit Experts® from the store near you will make it fresh for you to enjoy right when you arrive! Welcome to Dine In Connecticut, the state's largest and fastest growing restaurant marketing service. We would be happy to assist you with any lunch, dinner, party platters, or buffets that you would like to have delivered. We will help you figure out what to order, place the order, manage the restaurant, arrange the pick-up, delivery, set-up and clean up of the order.